This year, hot dogs are gettin' wild. Nothing says 4th of July more than a good ol’ fashioned hot dog. But these hot dogs aren’t your regular go-to dog. They’re spiral hot dogs, and they’re so much cooler. Because of their spiral quality, they get really crispy and become caramelized on the inside when they’re on the grill. Plus, the open pockets are an excellent vessel for your condiments. 1. Carefully skewer hot dogs. 2. 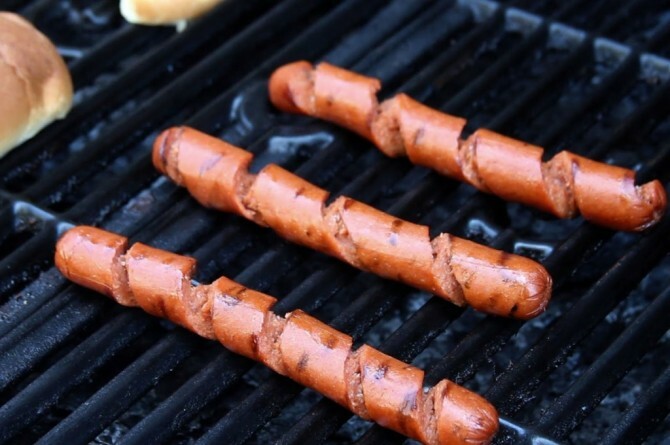 Cut the hot dog in a continuous diagonal downwards motion around the skewer and gently pull apart. 3. Slide skewers out of the hot dog. 4. Grill hot dogs and buns on medium heat until crispy. 5. Add desired condiments and serve.